Our outdoor backyard greens set the standard for others to follow. All of our greens, no matter the size, are designed for optimal playability, shot receptiveness and over-all realism. Our team of professionals has years of training on creating both exceptionally functional and stunningly beautiful greens and green-scapes. 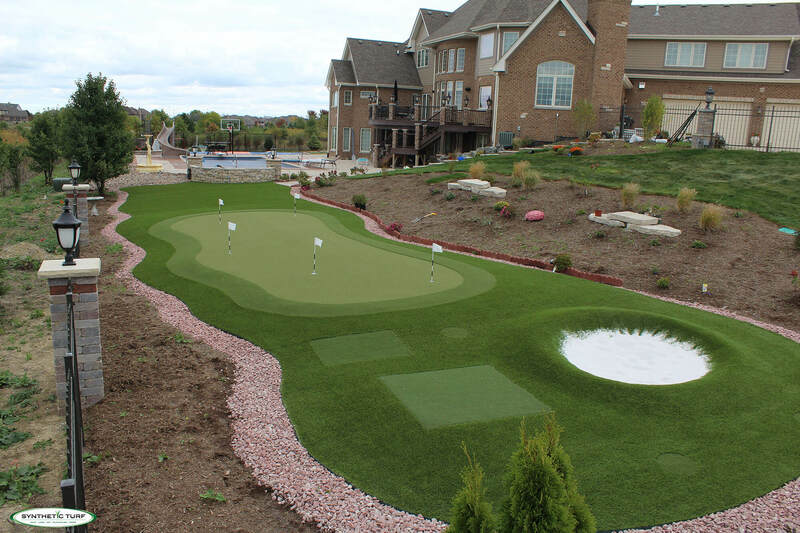 Synthetic Turf of Illinois offers both short-piled nylon greens, ideal for optimal putting and least maintenance, as well as polypropylene sand-filled putting greens when chipping outside of 20 yards. Not all greens are created equal. Contact us today to find out which one is best suited for your needs and space. All of our putting green turfs are made in the USA and are designed to perform just like the real thing. Our greens are used by more universities, country clubs, and golf instructors than any others in the region due to the quality of our products and our installation. We have been building residential greens, both indoor and outdoor, all over the Chicagoland Area and the Midwest for over 15 years. We understand that the most important part of golf is the short-game. Synthetic Turf also offers complete green complexes with bunkers, mounding and multiple chipping stations or tee boxes to be able to practice all areas of your short-game. All of our putting greens are extremely durable, especially when constructed with our modular base panel system, Our “true roll” NPT50 is used in places such as The Kevin Weeks Putting Studio at Cog Hill, Rich Harvest Farms and for golf-club manufacturer; Tour Edge Golf.